There are moments in the course of a journey when timing, location, and happenstance bend their powers in service of the unsuspecting traveler. This rare congress of fates, in my unbiased opinion, supplies the greatest memories from the road. I experienced such a moment this past December. I was passing through London for a couple of days, family in tow, as we made our way toward the States for Christmas. To escape the wind that whipped off the Thames and in the hopes of erecting a cultural cenotaph for my young children, we decided to wander over to the British Library to explore their “Treasures” room. Hopping off the tube at King’s Cross station, we raced along the sidewalk bordering Euston Road and fled from the cold into the cavernous spaces of the library. The giant, red-brick campus, flanked by Eduardo Paolozzi’s William Blake-inspired bronze sculpture of a hunkering Isaac Newton, was nearly empty on this frigid Thursday afternoon. The collection on display was mind-boggling. All those first editions of the pillars of Western literature resting in climate-controlled cases behind tempered glass. There was a Gutenberg Bible. The Magna Carta. Chaucer’s Canterbury Tales. Handel’s Messiah. Jane Austen’s private journal. Even Paul McCartney’s “Yesterday,” scrawled on a piece of scrap paper. The room was overflowing with masterworks of the written word. But the significance of all this culture was somewhat lost on my three kids. They paused only at the audio stations where they could put on headphones and listen to recorded excerpts of the pieces exhibited nearby. My wife and I tried to stave off their complaints until my eight-year-old daughter announced that she had to use the restroom. I suspected it was a ploy designed to give her a change of scenery. But, as usual, I couldn’t prove it and therefore had to acquiesce. I took her hand, and we headed out into the hallway, where I scanned left and right for signs of a toilet. Not far away, the universal male and female figures stood, stiff-armed, printed side by side on a card that pointed off down an adjoining hall. Following the sign, we rounded the corner and entered another chamber, at the back of which were the doors to the restrooms. But my attention was seized by something else entirely. Hanging on the near wall in the long room was a large, framed black-and-white picture. A dark-haired man with a square jaw stared moodily at the unseen camera. I recognized the portrait instantly. I had seen it many times before. It was the scraggly, weathered visage of Jack Kerouac, my favorite author, the godfather of the beat generation. Instinctively moving toward the picture, I traced the familiar lines with my eyes, until I glanced beneath it, and froze in my tracks. I had failed to notice that the entire length of the room was bisected by a long, unadorned, glass-topped case. Thirty feet long, it stretched almost to the restroom doors. My daughter was tugging my hand in the direction of the toilet, but I was transfixed. I couldn’t believe what I was seeing. I moved closer, hoping that I had not jumped to erroneous conclusions. I had not; I was looking at the scroll. In April of 1951, Jack Kerouac sat down at his typewriter in a cramped Manhattan apartment. 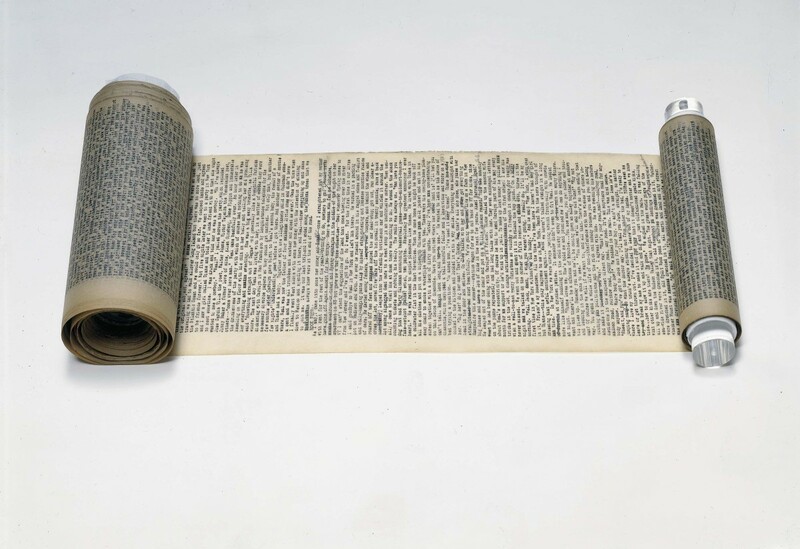 He placed a 120-foot long, taped-together roll of teletype paper in his typewriter. He spent the next three weeks in a frenzy, writing almost without pause, until he had recorded, with raw unfiltered emotion, the story of his trials and travels over the previous four years. He gave little thought to a title, simply calling the novel On the Road. The book inspired a generation of disenfranchised youths to abandon post-war conformity and head out onto the highways and railways of the American continent. These free-thinking, hard-living, good-for-nothing rebels crisscrossed the country, espousing a philosophy of living in the moment and, in the process, laying the groundwork for the peace-loving, love-making hippie movement of the following decade. I first read the book as a teenager, thirty-five years after it was published. It had exerted a powerful pull. A desire for pure, genuine experience crackled inside. I wanted to see and do for myself and live at full tilt, the principal goal of virtually every character in the book. Just like generations of young people before me, I felt like selling my soul to the open road, no looking back. Since that time, I’ve read and re-read most of Kerouac’s other works, but I always return to On the Road. There I stood, staring down at the original manuscript. It had languished in storage for nearly fifty years, until 2001, when it was purchased at auction for almost $2.5 million by Jim Irsay, the owner of the Indianapolis Colts. Shortly thereafter, Irsay had liberated the scroll, sending it on a tour all over the US, and now to Europe. It seemed oddly appropriate that Kerouac’s greatest work had followed a similar path to the author as it traveled the width and breadth of America and beyond. Roughly ten yards of the scroll had been unfurled and put on display at the British Library, with the rest still tightly coiled around a clear glass tube at the end of the case. I bid my daughter go on to the bathroom and began making my way up the long ribbon of paper from the bottom. The whole thing was tea-stain brown and chipping away at the edges. I felt that I was viewing an epic piece of cultural history before it disintegrated into the earth and disappeared forever. The manuscript was unparagraphed. Many passages were crossed out with rows of x’s. There were penciled-in notes by the author himself. Expletives had been chucked for less offensive phraseology. For the moment, I was the only one in this exhibit room, so that when I reached the top of the scroll, I was free to just stand and read. “I first met Neal not long after my father died,” it began. Neal Cassady’s name, along with those of William S. Burroughs, Allen Ginsberg, and every other participant in Kerouac’s life and adventures would eventually be changed at the insistence of the editors at the Viking Press to protect against libel suits. The events described in the book were so controversial and offensive that the final draft was not published until 1957, after heavy editing. Even in a softened form, the novel was incendiary. Published against the backdrop of McCarthyism and the Red Scare, unity and uniformity were widely considered essential parts of American culture. Ideas and lifestyles outside of the respectable mainstream, such as those presented in On The Road, were highly suspect. The book was a flagrant celebration of debauchery, drug use, unemployment, theft, and jazz music. It suggested an alternative way of living: full of passion and freedom. Within the pages of the New York Times, two different critics gave the book completely opposing reviews. Gilbert Millstein said it was written with “a beauty almost breathtaking,” while his colleague, David Dempsey, likened On the Road to “a road that leads to nowhere.” Nobody seemed able to make up their mind about Kerouac’s masterpiece. Except, of course, for the legions of readers that followed his lead and took to the road or found other ways to rebel while staying put. My daughter returned from the restroom. She was ready to rejoin the rest of the family. I pulled myself away. I could not pull myself away, not yet. My favorite book had suddenly taken on a very personal tone. It struck me that On the Road was really just a diary of one man’s passage through youth. Kerouac had not sought to create a movement; he had simply tried to tell a story straight through, a story about what happens when we have faith enough to walk out the front door and leave what we know behind. What more could we want in a novel. Chris Watts is a regular contributor to EthnoTraveler. His last piece was about a solipsistic journey into India’s Thar Desert.